The Financial Aid application, award, and monitoring process involves the collection and tracking of student and family data, forms, checklists, decisions, and awards. In addition, you need summary level data to help you fairly and efficiently allocate limited resources. 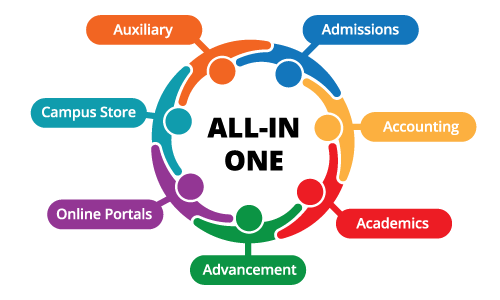 And you want award information to be available to your admissions, enrollment, and billing systems. ✓ Customizable checklists to track all requirements by family. ✓ Automated mailing process with customized letters for outstanding requirements, decisions, and awards. ✓ Easy monitoring of budgets, awards, and remaining funds for unlimited categories of grants, loans, and named scholarships. ✓ Financial aid amounts can be integrated with the admissions, enrollment, and billing processes for inclusion in documents, and to enable automatic deduction from parent tuition statements. ✓ Sophisticated reporting for aid amounts by category and family income. ✓ Add the Dashboard for Admissions for graphical analysis and up-to-the-minute reporting.